It’s been pretty busy around here lately. We are all hurrying up to wait for my new baby niece to arrive (she was due last Saturday). My sis, Katrina, and my mom and Katrina’s best friend, Missy, came into Hutch yesterday and we just about had a full day of activities. Our day started out with an ortho appointment for Cade and then we met up with the rest of the clan (there were 4 of ladies and 6 lil’ ones!) at Dillards so that the last minute newborn sleeper could be bought 😀 Then we headed over to Freddy’s for an early lunch. After our yummy burgers and fries (and frozen custard…mmmm) we went to check out Smith’s Market, Apron Strings, and then Glenn’s Bulk foods…all places that I’ve grown to love, places that I’ve got my mom hooked on, and now my sister and her bestie have been lured in to them as well. It was fun! I’ve made a couple of changes to some of the recipes I’ve posted: I forgot about the cocoa in the frosting for the Texas Sheet Cake and found a better way to cook corn on the cob :D.
Foot Update: I had my MRI this morning and I’ll get my results when I meet with the doctors on Thursday. 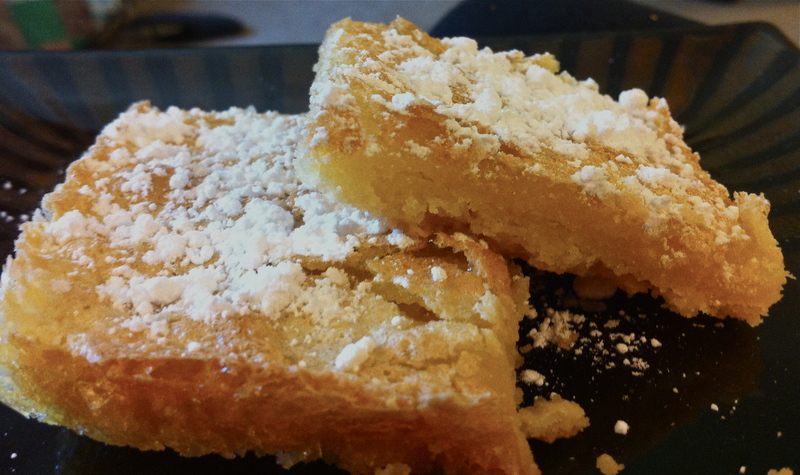 And on a completely different note…..Lemon Squares. Reagan has been asking me to make these for several days now, and today was the first day I’ve been home long enough to get them made. These are buttery and lemony and very yummy!! Preheat oven to 350 degrees. Line a 9×13 pan (for a thicker bar) or a 10×15 baking sheet (for a thinner bar) with foil. Spray with butter flavored cooking spray or brush with melted butter. 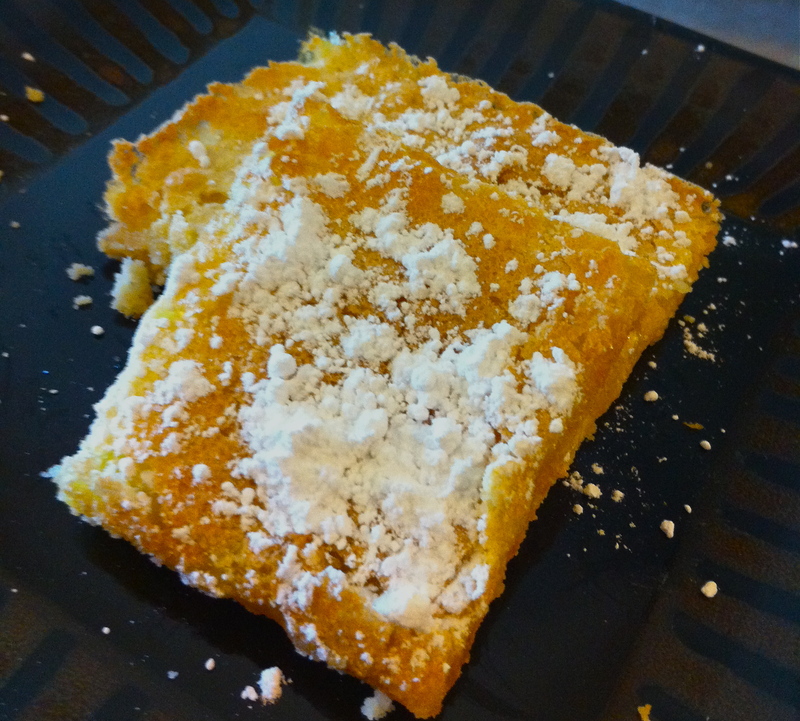 In a medium bowl, combine butter, flour and powdered sugar. Stir well with a fork and dump dough into greased pan. Spread out with your fingers. Bake for 20 minutes or just until slightly browned around the edges. For Topping: In your mixing bowl, beat eggs with whisk attachment for about 1 minute using medium speed. Increase speed to medium-high and whisk for another 2 minutes, gradually adding sugar. The mixture should be light in color and slightly thick. Add lemon juice, lemon zest, baking powder, salt, and food color. Beat for 1 more minute. Pour over the top of the HOT crust. Bake for another 25 minutes (or longer…the top should be browned and firm to the touch). Let cool for 3-4 hours before cutting. Remove entire bar from pan by pulling up the foil. Place on cutting board and flatten down the sides of the foil. Cut into desired size of squares. Remove from foil and let air-dry for an hour or more. Dust with powdered sugar.